Material strength, appearance and the tools you have available are all important factors to consider when deciding which corner joint to use. But nothing is more critical than good preparation. 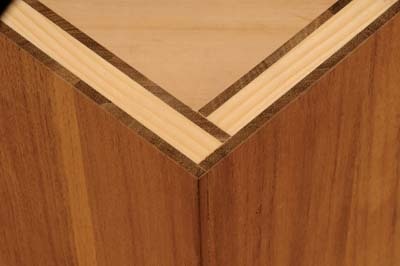 No matter how well the joint is cut it's likely to fail if the material is not square and true in the first place. 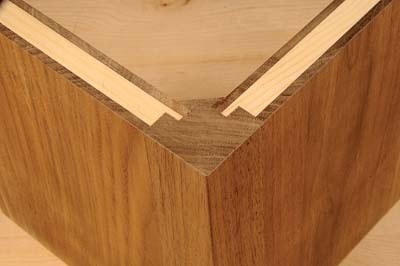 The majority of corner joints require a lap of some sort. 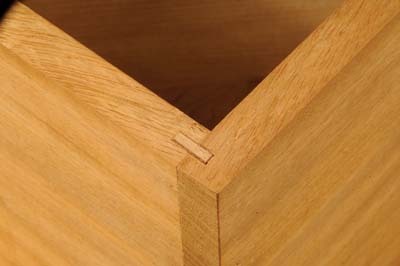 Even a lap dovetail joint must have a perfectly square edge on the pins. So let's assume you have prepared your stock and way up the options. But first, why this type of joint at all when a dowel, mortise and tenon or frame and panel might do just as well? Without exception all of the joints mentioned in this article have a structural integrity that is not completely dependent on other carcass components for their strength. Although not every one is suitable for every eventuality and some will undoubtedly be over engineered for some tasks, they can all be produced at the bench. These joints will allow you to finish your sides flush or create a stepped shoulder to suit and incorporate decorative features like chamfers and mouldings. Simple they may be but each one is a real test of your hand tool skills requiring clean lines and square faces and all the more rewarding for the effort involved. 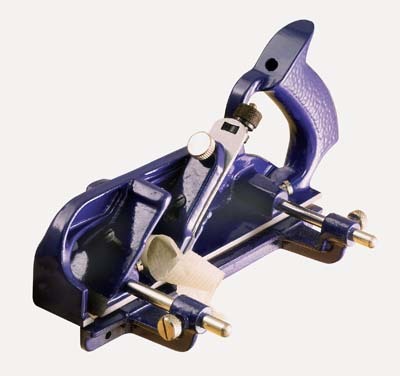 The following traditional joints can all be made with a rebate plane and a grooving plane and therefore avoids the need for a biscuit jointer, Domino or router. 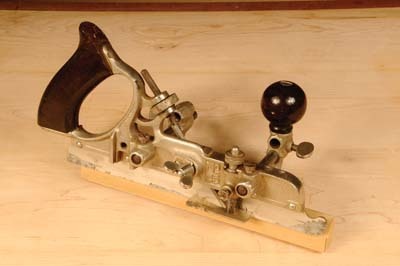 The Stanley No.78 rebate plane is still being made and is my choice for simple rebating by hand. It was first offered for sale in 1885 and ran through to 1973. Record made the same plane from 1938 and it's still being made today, the 778. The picture below was courtesy of www.tooledup.com and sells for £117. In my opinion the 78 comes in for some fairly harsh criticism from those expecting a cabinet quality finish from what is best suited as a jointing tool. Like all your hand tools the sharper the better and the 78 is not very forgiving if you have a tendency to be a little relaxed about this. 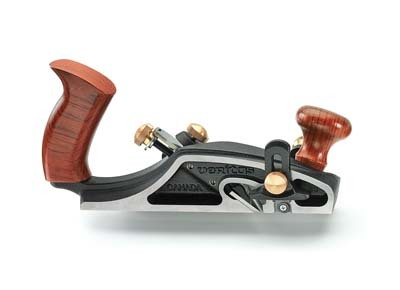 In which case you may want to have a shoulder plane on standby if this is your first foray into using a rebate plane. 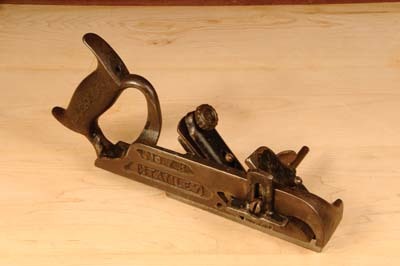 For rebates on display a skew blade is recommended especially when working across the grain. Veritas produce such a plane and although I have no first hand experience there are some favourable reviews published online. Try the BriMarc website. It will set you back £266. 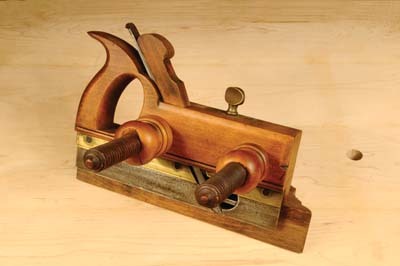 A good grooving plane is the Stanley No.45, which was shown last month in F&C (May 179). 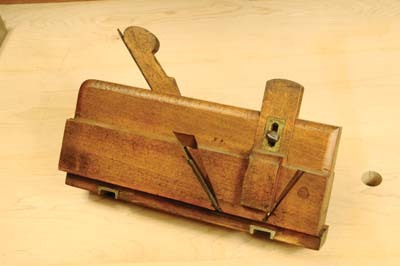 Then of course there are a host of wooden planes that can be used but more often than not these once state of the art tools have not stood the test of time. Sadly, attempts at correcting these beauties are rarely successful but don't let me put you off from adding them to your collection. 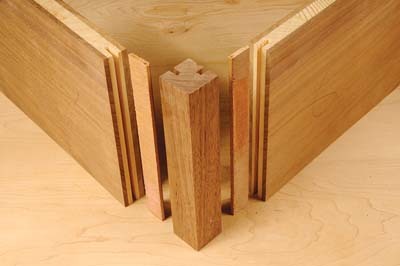 The object of creating most joints is to increase the gluing area of the two meeting pieces and to take advantage of the inherent strengths of the material. I've chosen five joints to illustrate the various ways in which this can be achieved all of which can be modified to suit your needs. These are a simple but very effective way of jointing a corner. Once the grooving plane has been set so that the cutter is in the centre of the board there's no need for further adjustment. Always work from the finished face of the boards so that they are flush when assembled. This makes things easier for clamping and reduces the amount of cleaning up required after gluing up. Plywood is the most convenient material to use for the tongue. It's stable in both directions and can be ripped off a sheet at the desired length relatively quickly and spare lengths kept for use at a later date. From this example you'll notice that it's not the most attractive feature when viewed from the top or bottom. 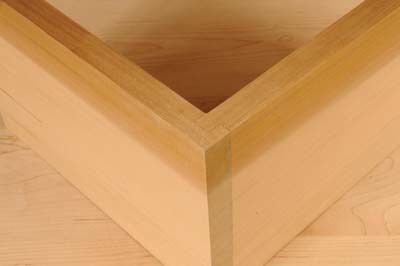 This is a much stronger corner joint made by using a solid square block of wood tongue and grooved into the ends of two boards. These ends effectively become shoulders where they meet the face of the corner post. On solid wood construction this may cause a problem with shrinkage if the grain is aligned with the corner post. Quarter sawn timber is dimensionally more stable but can display two types of grain pattern on the visible edges (for more on this subject see F&C 173). A contrasting piece of timber could be used here as a detail. avoid them meeting in the middle. This is another very strong joint, but it does require a slightly larger piece of wood for the corner post. or detailing without significantly reducing strength. end-grain makes it easier to achieve accurate results. 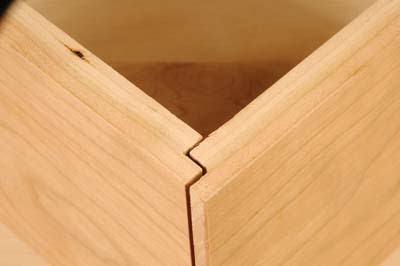 This is a useful joint in cabinet construction. Once again easy to mark out as the thickness of the boards used dictate the position of the groove. Try over-setting the groove a millimetre or so to leave a small overhang to plane or sand off when the joint is assembled. Remember to allow for this when working out your cutting list. If external dimensions are critical to your construction it can sometimes be beneficial to use the internal face of the carcass as your datum as the wall thickness will not change significantly. The material left behind at the edge of the board after creating the groove is fragile, so care needs to be taken when assembling or testing for a good fit. 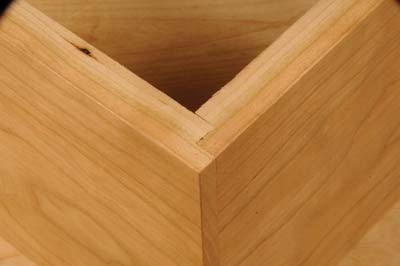 This type of joint is common on old furniture where the external faces might be veneered to conceal the end-grain. In terms of set-up this has to be the easiest of all the joints so far. Both rebates can be cut from the same setting on the plane. The rebate is exactly half the thickness of the board and equal in both directions. Equal amounts of end-grain are in contact with face material in both directions so the joint is structurally well balanced. This simplicity can quickly become a disadvantage however as the boards can be assembled incorrectly with little inkling of anything untoward until it's too late. Ok, so this is one that I produced on the spindle moulder using the Multiply. It requires some precise setting up as both glue lines are visible after assembly. I use it frequently on carcass construction where the back of the piece will be visible. Cutting the components from the same board and positioning them in the carcass as they have been cut results in seemless corner joints. Over-set the rebate to create the external lap by a few millimetres and you have the joy of scraping or planing flush to look forward to. You may be intrigued to know the identity of the block board I have been using throughout this article. Multiply is a range of materials from TIN TAB, consisting of three engineered products, all with structural integrity, stability and strength, Triply, Triply Mocca and CorkRubber. Tin Tab's desire to work with high quality, sustainably sourced materials led to importing their range of three layer solid timber panels, collectively known as Triply. Available in a range of face veneers, with either solid timber, birch ply or softwood cores. Face veneers are 4mm thick, rotary cut and run long grain, with sheet sizes larger than standard. Mocca Triply is an innovative variation to the Triply range. Thermo treatment to the panels produces a caramelised darker shade of the original timber that runs through the thickness of the face veneers and negates the need for staining. CorkRubber is a composite material combining the properties of both cork and recycled rubber. Available in three different grades. 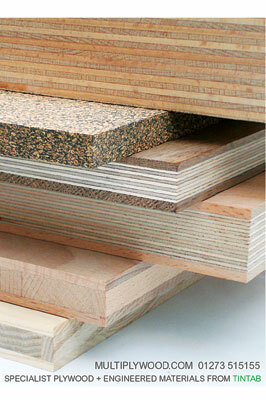 Also suitable for use as flooring and furniture products. To view TIN TAB projects that have utilised these materials visit the website.